Jenny Barden, author of Mistress of the Sea, has recently released her second novel, The Lost Duchess. I’ve invited her to visit Ascroft, eh? to tell us a little about her most recent book. You’re very welcome here, Jenny. I’m glad you are able to stop by. Hi Dianne and thanks for inviting me over; it’s lovely to talk with you. 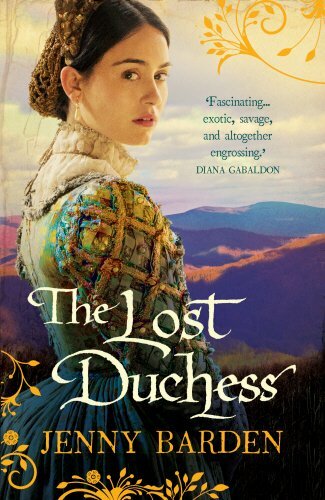 Ever since Sir Walter Raleigh’s settlement in Virginia was abandoned in 1587 its fate has remained a mystery; The Lost Duchess explores what might have happened to the ill-starred ‘Lost Colony’ and the first attempt to found a permanent English colony in America. What prompted you to write about this historical event? How closely did you stick to the historical facts? If you used them loosely, how did you decide whether to deviate from them? JB: I think what really inspired me to want to write the story was a fascination with the mystery that remains unsolved to this day. What happened to the Lost Colonists? That’s a question everyone wants to know the answer to, and the fact that they left such puzzling clues as to their whereabouts which no one was ever able to follow through to an answer makes the enigma even more tantalizing. When I read that the Colony’s Governor returned, three years after leaving to summon help, and found no trace of the Colonists except for the letters ‘CRO’ carved on a tree, and the letters ‘CROATOAN’ at the entrance to the fort, without the agreed sign of a cross, or anything else to suggest that the Colonists had left under duress save the ruined state of the settlement, then I was hooked, just as countless others have been captivated by the story. If the Colonists had gone to Croatoan then why had they not spotted the arrival of the relief ship and set a signal fire or sent out a boat? Where were they? It was as if Governor White had gone back only to find echoes: messages left by his family and countrymen that he could never respond to. We’ve all experienced the anxiety of broken lines of communication, but this was more extreme, involving messages that still resonate many generations afterwards which are epic in historical significance. Added to this there’s always the faint possibility that some of the Colonists may have survived long enough to leave bloodlines that were not wiped away completely from the face of the earth. There may be Americans alive today who are their descendants. In writing The Lost Duchess I kept very closely to the facts relating to Roanoke, trying to leave nothing of significance out and not to distort as much as is known. I also used a lot of invention in that I made up stories around my central fictional characters and wove them into the factual framework. I suppose my most adventurous embellishment was to introduce one of the Queen’s ladies and imagine how the Roanoke story might have played out if a woman close to the Queen had been involved from the start. As a self-imposed rule with my historical fiction I never change the facts, but neither will I stick rigidly only to what is most plausible in filling in the historical gaps. In other words, I’ll make free use of my imagination within the constraints of what is known. So the Earl of Hertford is a lecherous manipulator in my story, and Simon Ferdinando is an agent of the Queen’s spymaster; both are suppositions, but both are possible given what the records tell us. JB: I did masses of research, from visiting Roanoke and the wider area to the remains of Richmond Palace, now little more than a lawn in a garden by the Thames. The research was many faceted; I moved from an internet trawl to the history books to the first-hand accounts which were my main points of reference. The internet gave me leads to ongoing investigations. While I was still in the midst of unravelling the history, the news broke of the discovery of a patch on a map in the British Library which was found to conceal the icon of a fort. Then speculation ran rife that this might mark the spot where the ‘Lost Colonists’ had relocated. I decided I’d try to work that finding into my story as well. 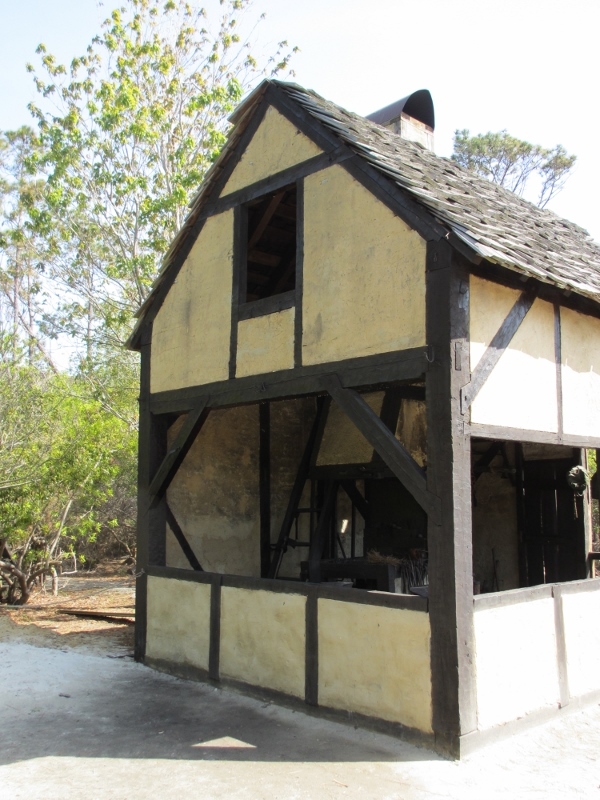 For anyone interested, most of the first-hand accounts relating to the Lost Colony are contained in The First Colonists – Documents on the Planting of the First English Settlements in North America 1584-1590 edited by DB and AM Quinn. This includes Governor John White’s record of the 1587 expedition which he kept as a kind of diary. The non-fiction texts that I found most useful were Giles Milton’s Big Chief Elizabeth and Karen Ordahl Kupperman’s Roanoke – The Abandoned Colony. I also made extensive reference to two British Museum catalogues focused on John White’s paintings, with expert analysis, edited by Kim Sloan. I spent time exploring the Island of Roanoke, the Outer Banks, and the wider area around the Pamlico Sound. This was followed by trips to Puerto Rico and the sites of some of the old royal palaces in England. I also went to Plymouth, and the tiny village of Fifield in Oxfordshire, and a host of other places with a connection to the story. 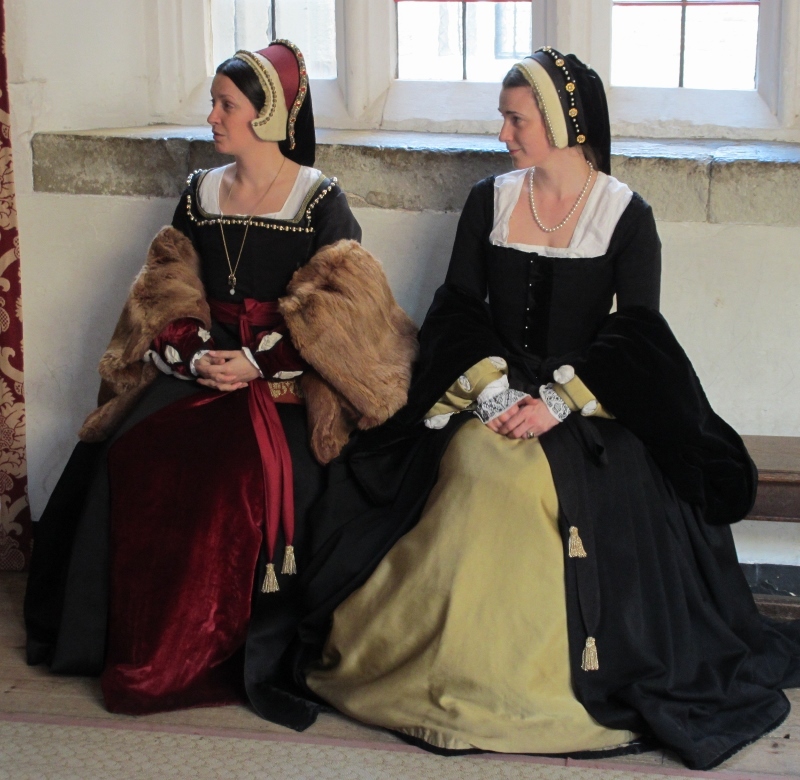 The final layer of research was all to do with detail and the recreation of the experience of living in the late sixteenth century and through the events at the core of the story. I visited museums and art galleries, castles and period houses. I went back to the ‘Golden Hinde’ reconstruction near London Bridge, and consulted volumes of Elizabethan maps, costumes and recipes. The music of Tallis, Byrd and Dowland would put me in the mood for writing, as would reading extracts from Shakespeare, rubbing rosemary, and handling the caliver I’ve had specially made – that’s a kind of early musket, the most commonly used firearm in Elizabethan times. I’m a bit obsessive about getting the details right! JB: I use both real figures from history and invented characters – in fact, a bit of both as well! When all that exists of a real character in history is a name, then, of course, that character is essentially made up. That’s the case with Emme Fifield in The Lost Duchess who assumes the name Emme Murimuth in order to go on the voyage. This is then misspelt as ‘Emme Merrymoth’ and a woman by that name was actually recorded as one of the Lost Colonists. Is she invented? I’m asking you that question with a smile on my face because I think this goes to the root of what novelists do. In truth, whenever we write about a real figure in history, even a very well known one, that character is re-invented. The Wellington who appears in Bernard Cornwell’s Sharpe books is not the same Wellington who appears in George Macdonald Fraser’s Flashman. We’ve all seen a softer side to Thomas Cromwell since Hilary Mantel showed him kissing his dog! As between famous historical figures and those that are invented, I think the real figures are usually easier to write about simply because the records provide a starting block and familiarity helps with the rest. It’s a bit like humming a few bars of a popular tune knowing that whoever is listening will remember what comes next. So with Queen Elizabeth, everyone has an image of her and knows her place in history. I only need to brush in a few details to bring that image to mind. The feather is a small detail, and fiddling with it is a displacement activity on Emme’s part because the Earl has touched on the truth and she is uncertain how to answer. The slightly archaic vocabulary of Hertford’s speech helps set the historical context (no one would speak of a ‘young maiden’ now), as does the fact that Emme is sitting on a cushion (the Elizabethan equivalent of a comfy lounge chair). Most importantly, in terms of taking the reader into this scene, is the toying with the feather, which should be immediately identifiable – it’s something we’ve all done. By using a multitude of these little connections I aim to take the reader to another time and place. As regards the re-creation of people, it’s really crucial to get a feel for their language, idiom, attitudes, beliefs, culture and aspects of their normal everyday lives that for us might seem very strange. But none of this should ever be so different that it becomes hard to empathise with or understand. In a nutshell, it’s the gradual accumulation of detail that can be referenced by the reader that works best in creating the historical backdrop. JB: The male/female divide in historical fiction is an interesting subject. I’d say that the reason there seems to be more scope in historical novels for male characters is because more has been documented about men in history. Why? Put bluntly (and I agree with Philippa Gregory on this) it’s because historical records were usually compiled by men, about men, at the direction of men, to be read by men. Up until recently, most women (unless they were queens) featured only at the periphery of historical accounts. I came across a good example of this in my research for The Lost Duchess. In the records pertaining to Roanoke the names of all the principal indigenous male leaders are noted, but the Croatan tribe, England’s key ally in the region, was led by a woman (the mother of Manteo, the Colony’s interpreter and guide). We do not know who she was; her name was never written down. Indeed, hardly anywhere in the Lost Colony accounts can we find the names of female American-Indians. It’s as if women, even chiefs, were not considered important enough for note by the men from England who did the record-keeping. Needless to say, that does not mean they did not exist! In my view it is up to historical novelists writing now to redress this imbalance in perception, to try and present a more even-handed truth. So in my stories both men and women are given significant roles. I write from the point of view of both, through the eyes of both hero and heroine. As for which I prefer to write about, I find writing from both perspectives equally satisfying. I suppose, if I’m honest, I have most fun as a man in the thick of daring-do action, but I find the subtleties of women increasingly fascinating to sculpt as characters. For the reasons I’ve given earlier, there’s often more help in history with regard to male figures in the sense of providing evidence for their role in dramatic situations. The conclusion should not be that women weren’t involved in exciting episodes in history, but in putting them there a novelist may well have to field accusations of invention. Men writing about men have an easier time of it! Thank you for your very informative and interesting answers to my questions, Jenny. It gives me an insight into how you wrote the book – and also makes me eager to read it (it’s in my tbr pile!). Thank you so much for your interest, Dianne; chatting with you has been a real pleasure. Readers can learn more about Jenny by visiting her website and blog, as well as her Facebook and Twitter pages. She is also a contributor to the English Historical Fiction Authors blog. The Lost Duchess is available on Amazon US & Amazon UK as well as other retail outlets. About Jenny Barden: She’s had a love of history and adventure ever since an encounter in infancy with a suit of armour at Tamworth Castle. Training as an artist, followed by a career as a city solicitor, did little to help displace her early dream of becoming a knight. A fascination with the Age of Discovery led to travels in South and Central America, and much of the inspiration for her debut came from retracing the footsteps of Francis Drake in Panama. The sequel centres on the first Elizabethan ‘lost colony’ of early Virginia. She is currently working on an epic adventure during the threat of invasion by the Spanish Armada. Her work has appeared in short story collections and anthologies and she has written for non-fiction publications including the Historical Novels Review. 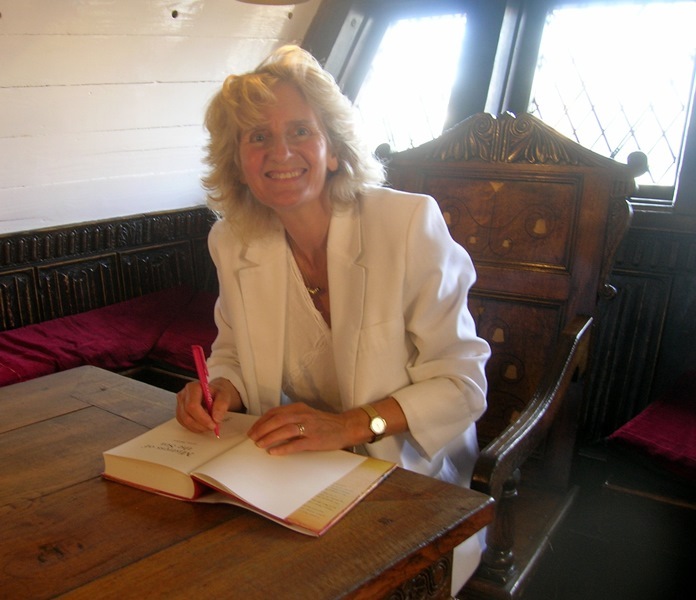 She is active in many organisations, having run the ‘Get Writing’ conferences for several years, and undertaken the co-ordination of the Historical Novel Society’s London Conference 2012. 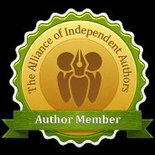 She is a member of that organisation as well as the Historical Writers’ Association, the Romantic Novelists’ Association and the Society of Authors. She will be co-ordinating the RNA’s annual conference in 2014. She has four children and now lives on a farm in Dorset with her long suffering husband and an ever increasing assortment of animals. She loves travelling, art, reading and scrambling up hills and mountains (though she’s not so keen on coming down!). This entry was posted in June 2014 and tagged Croatan tribe, Elizabethan era, First American Colonists, Jenny Bardon, Roanoke, The Lost Colonists, The Lost Colony, The Lost Duchess. Bookmark the permalink.